Perfect for workouts or sport activities, the invisibobble Power Hair Tie holds unruly, hard-to-tame hair in place without the use of clips and pins. 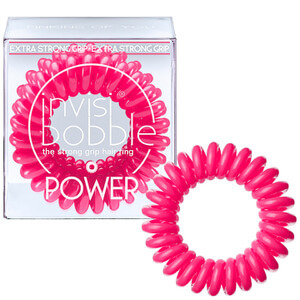 Fun and functional, its ultra-comfortable, intensified spiral shape prevents headaches and kinks, whilst its hygienic, non- soaking design and smooth surface means it stays dry even when worn on your wrist. Can be used in wet or dry hair without tangling, breakage or snagging.